5.1. 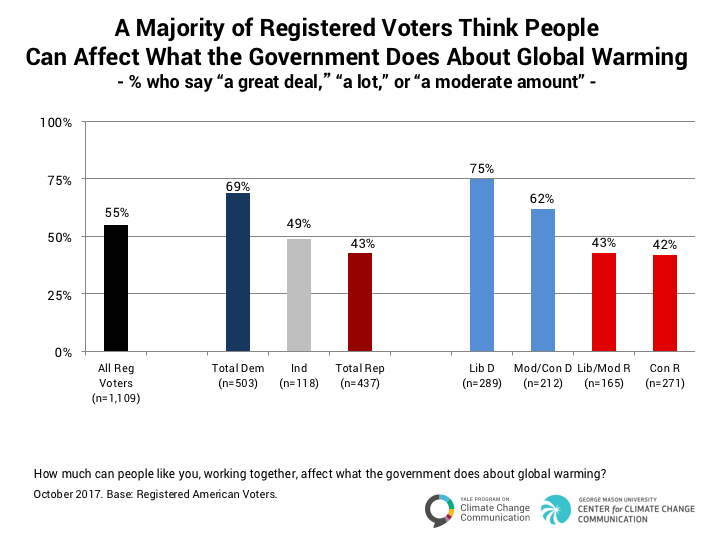 A majority of registered voters think people can affect what the government does about global warming. Perceptions of collective efficacy regarding global warming – the belief that like-minded citizens can work together to influence government action on global warming – is an important motivator for individuals to take action.Bandura, A. (2000). Exercise of human agency through collective efficacy. Current Directions in Psychological Science, 9(3), 75-78. DOI: https://doi.org/10.1111/1467-8721.00064 A majority of registered voters (55%) think that people like them, working together, can affect what the government does about global warming “a great deal” (8%), “a lot” (14%), or “a moderate amount” (33%). About seven in ten Democrats (69%), half of Independents (49%), and four in ten Republicans (43%) think people can affect what the government does about global warming. 5.2. 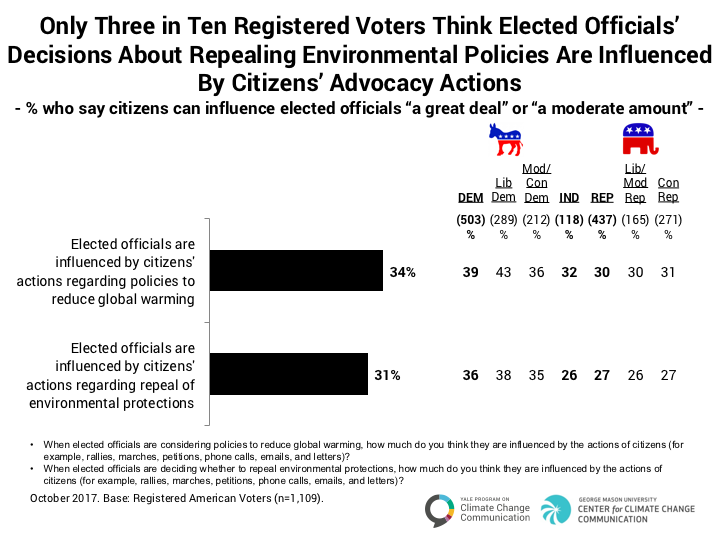 Only three in ten registered voters think elected officials’ decisions about repealing environmental policies are influenced by citizens’ advocacy actions. Only one in three registered voters (34%) think elected officials are influenced by the advocacy actions of citizens when considering policies to reduce global warming, and three in ten (31%) think officials are influenced by citizens’ actions when deciding whether to repeal environmental protections. Liberal Democrats are the most likely to think so (39% and 36% respectively) while conservative Republicans are the least likely to think so (31% and 27% respectively). 5.3. 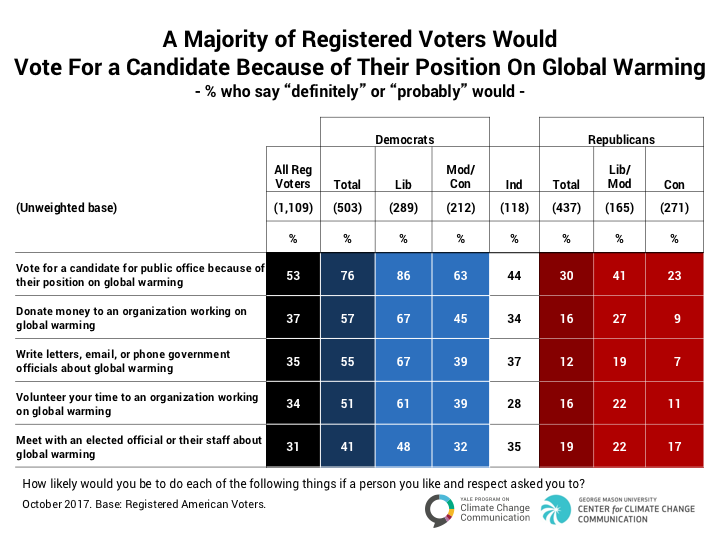 A majority of registered voters say they would vote for a candidate because of their position on global warming. The majority of registered voters say they would vote for a candidate for public office because of their position on global warming (53%), including a large majority of Democrats (76%), but only a minority of Independents (44%) and Republican (30%). Three in ten registered voters or more say they would donate money to an organization working on global warming (37%), write letters, email, or phone government officials about global warming (35%), volunteer their time to an organization working on global warming (34%), or meet with elected officials or their staff about global warming (31%). Democrats would be most likely to take these actions. Independents and Republicans are less likely. 5.4. Few registered voters have urged an elected official to take action to reduce global warming during the past 12 months. Three in ten liberal Democrats have done so. 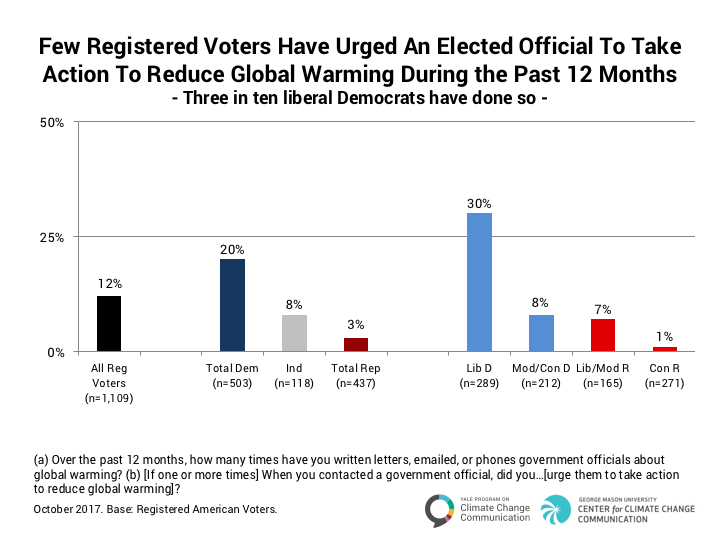 Only one in eight registered voters (12%) say they have contacted an elected official during the past 12 months to urge them to take action to reduce global warming. However, about one in five Democrats (20%), including three in ten liberal Democrats (30%) say they have done so. Eight percent of both Independents and moderate/conservative Democrats also say they have done this. Just 3% of Republicans say they have done so. 5.5. About four in ten voters say they are participating in, or would join, a campaign to convince elected officials to take action to reduce global warming. About four in ten registered voters (38%) are participating (2%), or would definitely (12%) or probably (24%) participate, in a campaign to convince elected officials to take action to reduce global warming, an increase of seven percentage points since our previous survey in May 2017 (see Data Tables). This includes about six in ten Democrats (59%, +10 points), including 75% of liberal Democrats (+16 points) and 38% of moderate/conservative Democrats (-1 point). Three in ten Independents (29%; -1 point) and 14% of Republicans (+3 points; 25% of liberal/moderate Republicans, +10 points; 6% of conservative Republicans, -4 points) are participating in, or would join, such a campaign. 5.6. 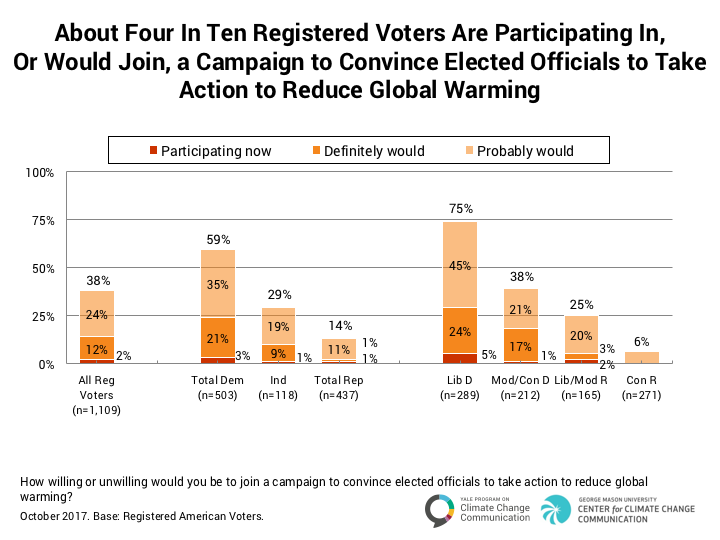 One in five registered voters say they have volunteered with or donated money to an organization working to reduce global warming. 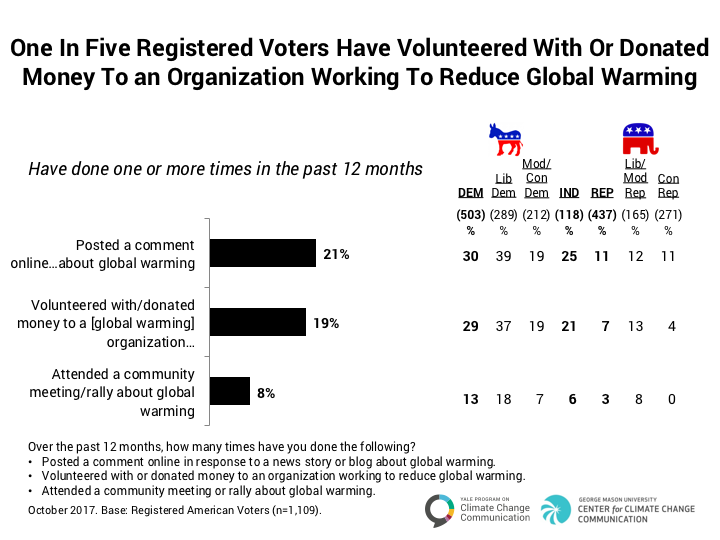 One in five registered voters (19%), including 29% of Democrats and 21% of Independents, say they have volunteered with or donated money to an organization working to reduce global warming over the past 12 months. Similarly, 20% (29% of Democrats and 25% of Independents) say they have posted a comment online about global warming. Fewer than one in ten (8%, including 13% of Democrats) say they have attended a community meeting or rally about global warming.